Last week I took my wife and kids to visit my family in Roswell, New Mexico. It was unexpectedly one of the most enjoyable trips to NM that I've had. A big part of it was that my brother served as our unofficial tour guide. The man is a fountain of knowledge about cool things to do in NM. One of his recommendations was to visit the Anderson Museum of Contemporary Art. The Anderson didn't exist when I lived in Roswell. What a jewel! Frankly it's hard to believe such a nice art museum is in my dusty little hometown. It is genuinely excellent. Even my kids enjoyed it and they're not big on art museums. 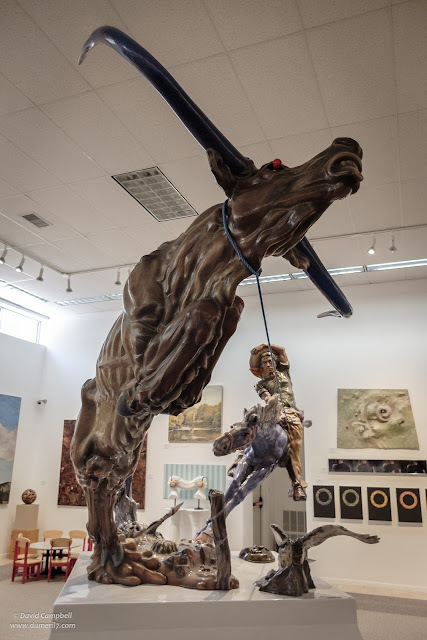 The Anderson museum showcases work done by participants in the Roswell Artist-In-Residence program, which has been hosting artists for 50 years. The range and quality of work is outstanding. These photos are of Progress II, a fiber glass sculpture by Luis Jimenez. 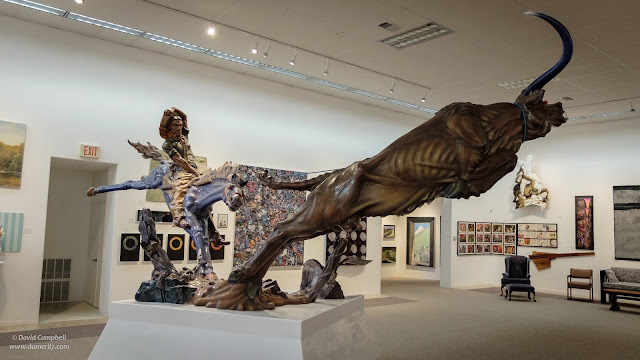 There are several sculptures by Jimenez in Roswell, including some at the Roswell Museum and Art Center (the other museum in Roswell). I grew up seeing them on grade school field trips to the museum. The size, medium, and perspective make them pretty spectacular. I like Progress II because of the strong sense of motion it has. You just point a camera at it and you have a dynamic photo! Jimenez died in a bizarre and tragic way – part of one of his large sculptures fell on him, severing an artery.